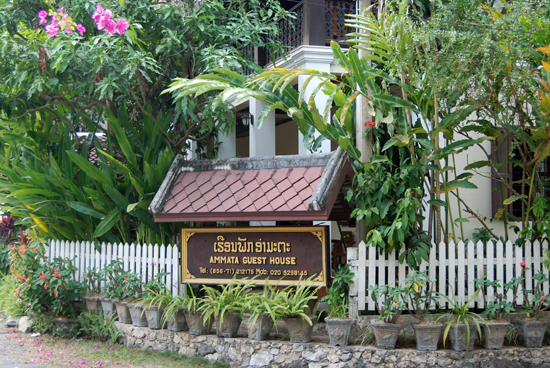 When people ask us for a recommendation of a nice midrange guesthouse in Luang Prabang, Ammata Guesthouse is one of our top picks. Starting at $30 a night, it’s not priced for the typical backpacker but for Luang Prabang this is excellent value, especially when based on double occupancy. It’s clean, simple and cosy, with a fantastic location in the heart of the old town. Average rating 8 from 203 reviews. 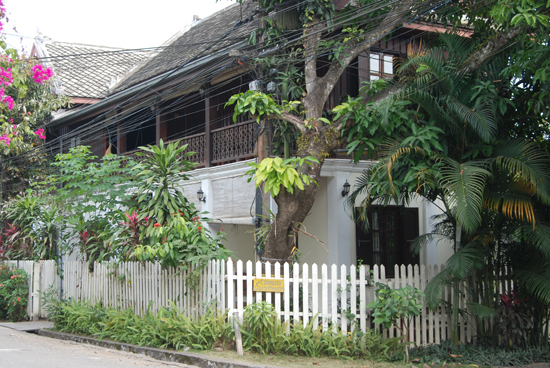 Ammata Guesthouse is on a charming lane tucked between the Mekong River and the main street. It’s an ideal spot. You are steps from the river scenery as well as some of the major temples, restaurants and the night market. The lane is quiet and receives very little activity — except when the monks come through to collect morning alms. There are two buildings actually. 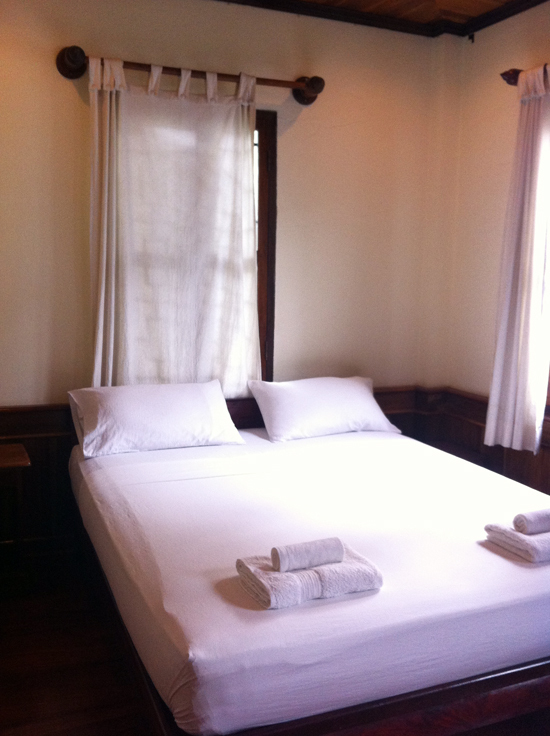 The older building, located beside Lotus Villa Boutique Hotel, has six rooms. Building two, diagonally across the way, is the newer build and has nine rooms. It won’t knock your socks off but we wouldn’t mind throwing down our backpack here. The rooms in the new building can be on the small side but are otherwise faultless, with neat and tidy with polished wood floor, furniture and chair rail moulding, plain cream walls and white linens along with air-con and a small TV. The new-looking bathrooms are spartan but adequate. They’re Western style (not a Lao-style wet room) with tile floor and a shower/bathtub unit with shower curtain. The rooms don’t have a hairdryer or safe but there’s a safe at reception where they can store your passport. There’s a balcony on the second floor for all to use, as well as a common area on the ground floor in the garden, a pleasant spot to catch up on some email. Overall we recommend the rooms in the new building. It’s $10 more and we think the splurge is worth it. Tweet, post and check-in from here. The original building shows its age more but it is perfectly fine if you can live without television or WiFi in your room. For internet, you’ll have to walk 15 steps to the other building – which may be a deal breaker for some. Tip: The rooms do vary in size and some receive more natural light than others. Upon check-in we suggest you ask to see what rooms are available. 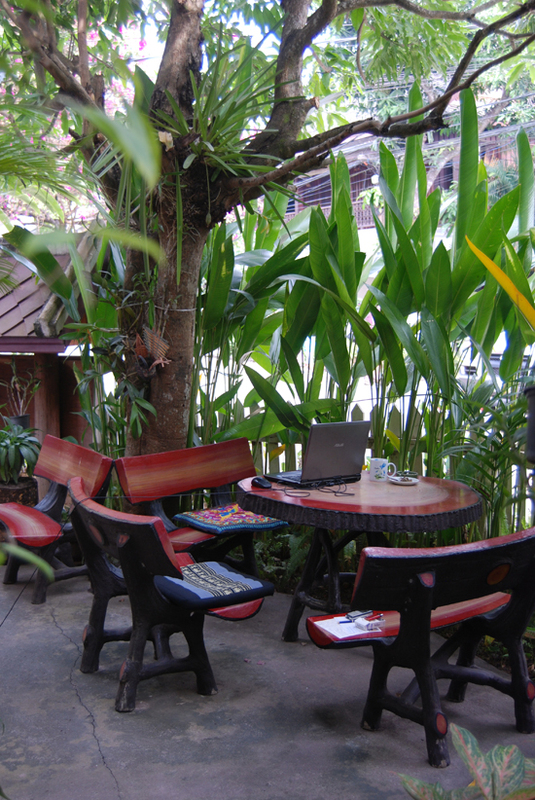 There is a kettle, tea, coffee and some fruit at reception but breakfast is not included so you can try Luang Prabang’s local breakfast eats or indulge in one of the town’s many Western-style cafes. As a comparison, we do like neighbouring Lotus Villa Boutique Hotel – it certainly has more frills, such as breakfast and bicycles, plus the privacy of an inner courtyard and hotel service – but you will pay almost double the price of Ammata Guesthouse in high season. Same location for two different budgets. Check rates at Ammata Guesthouse on Booking.com.